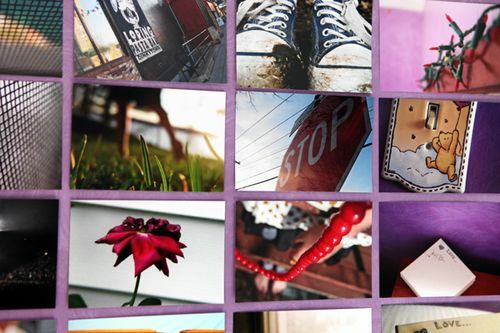 My budding teen-aged photographer recently placed an order at Shutterfly. There are a few things in my life that I have a hard time NOT saying "Yes, I will gladly spend money on your behalf" to. One is music. Another is books. The third? Pictures. Aidan uses a lot of discretion when editing her shot choices and this order came in at around 90 pictures culled from the last 3 months or her life. The orange envelope arrived and Aidan disappeared behind a closed bedroom door and said, "Do NOT come in here until I tell you it's okay." Immediately, I'm thinking, "What is going ON in there? Is she going to smoke a cigarette then try to air it out before we know any better?" and then I shudder, and remember oh yeah, that was ME when my Grandma came to stay with us that one time back in the '80s when my Mom and Dad went on vacation. I still remember my Nana saying later that night in my room, "Something smells AWFUL in here." Seriously? How cool is that? Just one big wall mural of her photos. And she grouped them by their color values. Warmer shots on the right, cooler shots on the left. I love her vision. I love to see what she sees through the lens. I'm not trying to sound all cool or nothin', but the little apple didn't fall too far from the tree. Except she landed without a pack of cigarettes hidden in her tube socks. P.S. When I was growing up, my Dad grumbled every time I put yet another nail into my wall only to secure my latest Cream magazine photo of Paul Stanley, and much later, Sting. I look at Aidan's walls as just a canvas for her personal expression. We'll have years to spackle and clean it all up and even then, maybe we won't really want to. Here's to supporting creative vision, in whatever form it takes. Besides, she used Scotch tape. Ahh that is great! She is a chip off the old block! I predict the next few years will have many Yes, I will gladly spend money on your behalf” moments when she requires fancy lenses for her camera! She is really good! Go Aidan! This looks great! Here’s to “just doing it” – if only I would actually spring into action and get SOMETHING up on my wall. This “thinking it through” part somehow isn’t all that beneficial. My dad went nuts over ANYTHING on the walls. even scotch tape or that wall putty stuff. Or colored paint, for that matter! Whatev, dad. I wanna *see* what is important to my kids right now. I could go on abt every part of this post, but I will leave it at: Amen, sister. To all of it. Love all the hearts. Go Aidan! Cathy, it’s a good feeling to be impressed by your kid. those are really great shots! love Aidan’s point of view. great way to display those photos. Like mother, like child. Loved Aidan´s shots. I tried to do red, orange and blue photos to match out kitchen (before we moved) I wan never really sure the colour thing was obvious though. I’m working on one which is green, yellow and brown now – more natural shots but I wasn’t sure how to make the colour clearer, I thought about a bit of photoshop-ing but maybe I can use this as inspiration and blend from yellow to green to brown from the top of the frame down. Thanks Aidan for the inspiration! My parent let me go nuts with my room when I was younger. I love them for it. Love that!! I think it is so cool to see how the world looks in our little ones eyes and how they interpret everything, especially in the creative realm. Kudos to Aidan!! Wow – so creatively wonderful. So nice your daughter is turning out to be a creative, wonderful young lady. Way cool Aidan! Love it! That is SO COOL! And look at the common space between the pictures. GO AIDAN! That is just beautiful. What a creative daughter you have. I’d love if my kids did the same… just wonderful. That’s terrific. Did you read The Last Lecture? His parents let him draw all over his walls. Awesome. Sometimes it’s hard NOT impose our ideas of what is suitable for our kid’s rooms isn’t it?! I smile at the blogs where expectant Mums proudly show shots of the nursery, all tastefully decorated. The first appearance of a page ripped from a Pokemon magazine stuck at a jaunty angle by my son on his bedroom wall, was my first lesson in letting kids express their OWN style not mine! Such a tough lesson in letting go. oh wow, that’s really really cool! Some of those shots are AMAZING! Go Aidan, indeed!! Very impressive, Aiden! Love the idea. I think I should do that with closeups from a cruise my husband & I took last year – and put these on a wall in my scrapbook room (my retreat). Aiden definitely has a fantastic eye through the viewfinder (that’s an old word) and, of course, the apple doesn’t fall very far!!! Go Aiden! I love what Aiden did. Grouping the colors is so great…not too sure if I would have thought of that. My daughter has magazine clippings all over her walls that I can’t see much of the painted wall. And then she complains because she wants to paint her walls purple, as if she could see it. oh i love that kid…awesome photos…she has vision far beyond her 13 years! you have an amazing family, cathy! wow, that is really cool. and that is all i have to say about that! WOw…..that’s it…WOW! Oh, and one question…when is Aidan going to do a “guest” blog entry…awesome contribution to creativeness. Awesome! Looks like she got more than just her good looks from her Mama. That is awesome! What a lucky Mom you are and what a lucky girl she is to have you as her Mama-cita! Love her creativity! The photo wall looks so cool! You totally got me with the pullback (is that a word?). I was convinced I was looking at a scrapbook page, and then scrolled down a bit, saw the wall, and I was totally, like, “Whoa.” Dude. Nice. Awesome. Your attitude is awesome. Her creativity is awesome. Just awesome. This is terrific. You are right about the little apple. Excellent use of even leading between the photos and love the warm to cool effect. You should fee proud. As someone taking your DYL class I can say she’s got it! Congratulations! Aidan, if you are reading comments, listen up…this is so cool. YOu are a such a cool kid. Love it! You have a great eye. Cathy, your grandmother story. oh my gosh. Cathy, hilarious. Jade, THAT is a cool idea! But funny, Jeanne… i don’t think there are any SAINTS pics up there. WHO DAT? Jennifer, one of my Design Your Life students just posted that this morning to tell me this. I have to read this book! She should, huh? She did one once. It was hilarious too! Margie, i’m wondering if my mom is just rolling her eyes right now! HA! Cathy, I love this and I love Aidan. Aidan, you are really really doing some cool stuff. I am proud of you as only a best friend of your momma could be! That’s so neat! She’s got a good eye! Love the idea! Ah Cathy, what a amazing creative kid you have!!! To be 13 and have that creative confidence:) too cool. And The story of your Grandma made me almost choke on my morning coffee, I was laughing so flippin hard. You amuse me to no end:) I am still putting up the good ” I don’t want to be penniless, loveless and insane” fight with the cigs. Thank you for your encouragement!!!!!!! Check out those CLEAN LINES! I don’t know how she got them so straight using scotch tape! I miss being 13! That is fantastic! Takes me back..I remember filling the walls in my room with cuttings from magazines, usually fashion shoots but also quotes and other photos I liked – I loved it. We just decorated our 13 year olds room and se got to choose paint – she now has two walls white, and two bright orange! I’m with you on the walls thing…walls can be repaired. I also feel that way about hair…it’ll grow back, even if you color it pink or cut it weird. When it doesn’t really matter what your teens do…let them BE. If it DOES matter or is permanent, then step in. Love this. Very cool girl. Great idea to line them up on the wall – It’s great that Aidan likes to take pictures. Isn’t it great when your kids share a hobby/passion with you? Question, what paper do you use to print 12 X 12 layouts? I have a new wide format printer and am looking for a good matte paper to use. Any suggestions? Cathy…you are an amazing mother! I love your relationship with your kids. Aidan…you are truly talented! I love all of your pictures and the way you displayed them…so very creative! Besides taking cool pics how cool is that mural on her wall? Tell Aidan she did an awesome job. And shame on mommy for wondering what it was she was doing in there! Very cool! Much more organized than the posters, photos, and magazine cutouts on my wall in high school. I think one of the reasons you get so much notice is not just your design skills, but also all the positivity you invest in raising your kids. It’s paying off! Good job, Aiden. How creative. And on the wall. maybe I will try this. I’ve been trying to decide what to do with these two blank walls. Hmmm! Cathy, you must be so proud. She’s really getting the drift. there must be something in the teen-age air. My small child (14) was taking pix like crazy this weekend. And practicing her own “eye” for creative angles and colors. Some were so good I printed them for me! I’ll show her this post later as she seems to be into and up to the same things as Aiden. That is so very cool! And very cool of you to be nurturing her creativity! awww. when i was her age i had a bulletin board covered in photos and ephemera and my walls were plastered with absolut vodka ads (i still think they’re pretty cool). she’s so classy for 13! I did a collage of pictures/drawings on my wall in high school and my dad FREAKED. Bravo for letting your kids express themselves and realizing that walls are just things. You can find the Last Lecture on You Tube (it’s about 70 mins long but totally worth it) and you can see the so mentioned walls… Your post totally made me think of that. that is awesome! i’m going to do that myself! i have a wall just begging for a treatment like this. thanks aidan! LOL! I know. Sorry. Just flashing back to my own, highly troubled youth. Go Aidan!!! Fabulous photographs and very creative idea. Cathy, I love that you allow your very creative children express themselves this way.. You rock. It’s great to see children have a love of photography, I was blessed with my daughter doing so. Hard not to when both her dad and I have had cameras clicking in her face for her entire life and shes 33!! I just might have to “Steal” Aidans Idea for my spare room. I wish that I was as cool as Aidan. I look back at the pictures of me at 13 and cringe. Braces, huge unmanageable hair, zits, (shudder)…absolutely horrible. I often look at the kids around me and wonder if they will have such “fond” memories of early teenagehood. They are all so beautiful now. Anyway, I think she is a super kid and hope that my girls (age 8 and 10) will be that cool and creative when they are a little older. They are well on their way now. That Aidan is one cool chica! It’s beautiful, Aidan! I love that you “get” it. So young and so talented – a very cool idea. So impressive! I love the mood, the shots, the arrangement. She obviously does share her mom’s talent! LOL! I was going to, I really was! Way cool. It is awesome to see such beauty come from a 13 year old. You have something that is nearly impossible to achieve with a 13 year old girl. She gets you. She is definitely her mother’s daughter! Very cool! She’s got a very good eye. Grouped by values? Are you kidding me? Awesome, kid! My granddaughter (lives with me) did a wall in her room like that…with all her friends and some relatives, all making funny faces! Whenever my adhesive is missing I know she is adding pictures to the wall. I wince as I see the paint come off, but you are right…I can always spackle! That is totally awesome! I admire Aidan’s artistic ability. That is beyond cool! I think the same way with my kids. You want to put it up…ok. Enjoy! My oldest daughter did the same thing in her college dorm room(not much else you CAN do when the walls are made of painted cinderblock) and it looks GREAT!. Don’t you just love to see bits of yourself come through your children in more than just a physical sense?! I do! Well … to be truthful, only when it’s one of my “good” traits!! 🙂 Aidan did a beautiful job and I’m so glad she let you share that with your bloggies. My youngest daughter loves to draw and her walls were plastered with her drawings and thumbtacks as she grew up. She’d rearrange them, take everything down from time-to-time and start a new collection … needless to say, her walls looked like swiss cheese when everything came down as she moved out. 🙁 Her dad and I knew spackling would be needed, but her room looked like a bad case of chicken pox covered with calamine lotion! Thanks for bringing that memory back for me. I can’t believe I never took a picture of that for posterity. Very cool! Great pics! Go Aidan! You have a totally cool and awesome Daughter and you are a totally cool and awesome Mom! You could benefit from using Fotoclips: http://photojojo.com/store/awesomeness/fotoclips I bought a box awhile back but have yet to use them. These would be perfect for Aiden! You have a good eye for photography and design! And congrats to Cathy & Dan for bringing up two cool kids! By the way, in case you’re looking for an alternative to Scotch Tape, I think UHU still makes UHU Tac Adhesive Putty which is fun and pretty forgiving stuff. Cathy – that is so fantastic. Doesn’t if feel great to be proud of your kids and the choices they make. Way to Aidan for sharing yourself. wow that’s so cool aidan ! I totally love this….she has amazing vision. Love how she matched all the cool and warm colors together. You’re right…the apple doesn’t fall far 🙂 Thanks for the inspiration Aidan! That’s cool! And nice reddish walls! Lee, someone reminded me of that stuff. Totally want to get some! How awesome is she? I’m still not that cool at 47, much less 13. Simply fabulous! And you’re right about those smokes! I always tell my kids you are so much smarter than me! Here’s to hoping they all stay that way! This is just too cool! Great job Aidan! What a great idea! What an awesome display of photos, she has a real talent! Congratulations for realizing the holes in the walls mean nothing, but a happy child who can express herself is priceless!! Great Job Mom. I just today saw a similar idea to this in the Photojojo book. Go Aiden! LOVE it! My parents never let me put anything on my walls (mostly cuz we moved a lot with the Navy) so I vowed my kids could do whatever they wanted with the walls of their rooms. My girls mounted their photos on large poster boards and ‘wallpapered’ entire walls of their room! Crazy busy for me, but they loved it and it was ok with me. You are SO right to encourage creativity in all forms! Im gonna go check the archives….some days you need a good laugh…perhaps my aging memory forgot that I read that the first time! Have a good one! There are so many reasons to love you Cathy but the fact that you don’t worship at the altar of unbroken, pristine smooth plaster/drywall is one of the big ones. Excellent montage Miss A. and embrace the blessing that is having a parent who allows you to express yourself on your space. Even if it leaves a mark. So very cool. Thanks for sharing. Wow! She definitely got some of her mama’s creative genes. She’s got a great eye for capturing pictures that most people 3x her age can’t capture. My gawd, that girl has what it takes. I DID notice the shading before you mentioned it. She’s got the eye Cathy, but be proud too. Love it! And as someone who grew up with stark white, unadorned walls, I say kudos to you Cathy for fostering such creativity! Wow! That is so awesome. She’s been paying attention, hasn’t she? Oh my gosh, just how wonderful that is? Wish I was younger and can do in on my teenager room wall 🙂 Awesome! You are such a cool mom! She will appreciate this many years to come. Aidan most certainly is the heiress of the “clean & simple” look. Who know, maybe someday she’ll write a bestseller book? What sort of camera is she rockin’? Just saw this post from a “you might also like” link. Love her project, and her photo of LPB reminded me that I love that place & have not been there in ages. And also reminds me of when it was just a corner drugstore. Maybe we should head there sometime soon and introduce my son to the lovely funkiness and great food. Well guess he can’t really have the food yet…soon he can, for now he could just soak it in. That’s an amazing idea. You never run out of creative projects. Thanks for sharing them.